Who would you like to buy from – someone who knows almost nothing about what they are selling, or an individual who clearly has a degree of expertise? Unless you are buying simple commodities, such as groceries, the chances are you would prefer to buy from someone who knows what they are talking about. But even with groceries, you’d often prefer an expert. After all, would you buy meat from a butcher who understood the cuts of meat they offered and how they can best be cooked, or from a kid with a cleaver who has just hacked away at a dead sheep for you? Your customers are the same as you; they want to buy from someone who knows what they are talking about. The more expensive the item or service you sell, the greater the amount of expertise that is expected. 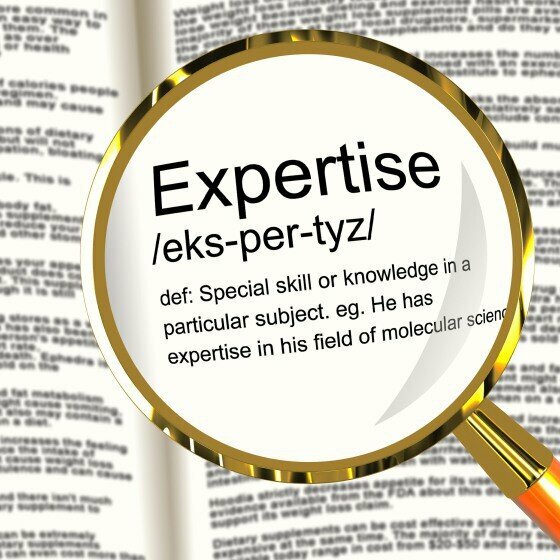 But how can you demonstrate expertise? Here are five ways you can reassure your customers that you know what you are talking about. These days blogs are fundamental to business success. Consistent research shows that blogging is linked to website visibility and lead generation. The more you blog, the more business you get. Plus blogging shows you know your stuff – as long as you blog about your topic and not about your business. In the recent article “Beauty is only blog deep“, individuals in the beauty sector were advised that they needed a blog to make sure their business was seen as being at the top of its game. When you use social media as a means of recommending useful things to other people, you are automatically seen as someone who has expertise. That assumes, of course, that what you recommend via Twitter or Facebook or LinkedIn adds value to your target audience. If all you do is provide status updates, share jokes or daft pictures, you are not going to be respected as an authority on your topic. As was explained by Inspection Certification Associates in their article “Use the Internet to Prove You’re a Home Inspection Expert” social media provides social proof of your expertise. It doesn’t matter if you talk to half a dozen people in a back room of a pub, or a thousand people at a trade show the effect is the same – the audience perceives you as an expert. Of course, your presentation needs to be good and well crafted, without “Death by PowerPoint”. But assuming you make a reasonable presentation or give a half-decent speech the audience will believe you are the expert. After all, they are in the audience – not up on the platform speaking. We tend to perceive speakers as experts; so get speaking. The word “author” is only the first part of the word “authority”. And someone who is an authority on a topic is clearly an expert. It doesn’t have to be a major work with a hundred thousand words. These days short books are in vogue. An ebook of just 30 pages is often enough to help you stamp your mark on your subject. And if you’ve written one of them, you can write another one, firmly establishing your expertise. If you offer yourself to journalists such as through Expert Sources you will get your name in newspapers and magazines or on radio or TV. That means that outside the realm of your blog or your social media activity your name is being associated with your topic. Journalists only quote “experts” on a topic, don’t they? These days reporters have to work much harder than they used to do. There are stricter deadlines, more space to fill and fewer journalists on the team. So they are relatively keen to hear from anyone who knows something about the topic they are writing about. If you make yourself available you will be much-wanted by reporters, further helping your expertise to be underlined. So, there you have it, five ways to prove you are an expert.